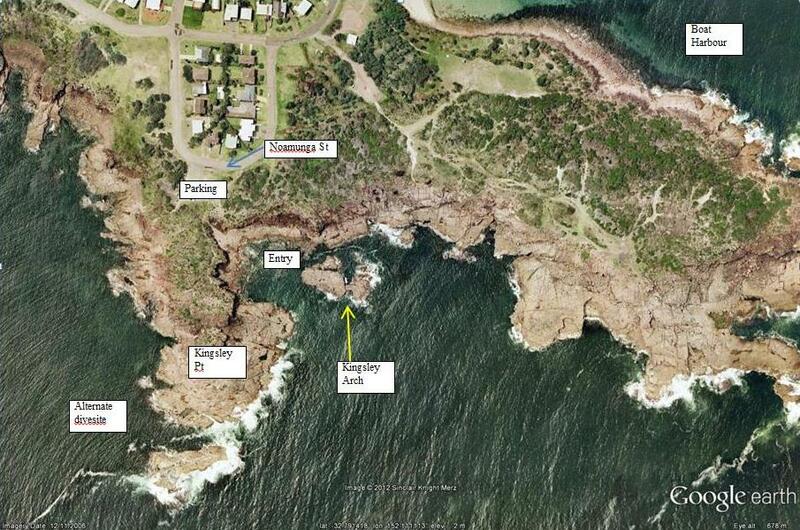 The Kingsley Arch divesite is just around the corner from Boat Harbour on Noamunga St. The entry is off the small rocky beach below the gravel carpark at the end of the loop in the street. Once you are in the water you can swim towards the Southern side of the small island that is straight out from the beach. There is a large swimthrough arch (Kingsley Arch) that runs completely through the island. This has some nice jewel anemones encrusting the walls and sometimes harbours interesting fish and invertebrate life. As you head further out from the island the bottom drops away in a series of gutters. These harbor PJ sharks during spring and shelter the usual selection of temperate reef fish for the rest of the year. If waves are running into the bay don’t bother as it will be rough and mucky in the water. If this happens have a look on the Western side of Kingsly Pt which also has some nice gutters, or head East and have a look in Boat Harbour which is usually more sheltered.